The Canadian Paul Landry (06/09/1955), explorer, author and adventurer, is one of the best known polar guides in the world. Hailing from Ontario, which is the Canadian province with the largest population, he loved the extreme cold from an early age, never hesitating to go off on his own, skiing in winter and kayaking in summer, exploring the many wild and wonderful areas located not far from the small community of Smooth Rock Falls where he lived. Paul worked for ten years at the Outward Bound School, with the last four dedicated to running the programmes of the Canadian Outward Wilderness School, which specialises in organising trips into the furthest flung regions and promoting the spirit of adventure in young people. It was there that he met his wife-to-be, Kathy McNair, with whom he has two children. As an explorer and professional guide, Paul Landry has reached the South Pole twice, crossed the continent of Antarctica once and acted as guide for clients four times to the North Pole. He has also scaled numerous peaks in South America and explored several of the major rivers in the great North American outdoors. He now lives on Baffin Island where, after working for 13 years for a Tour Operator specialising in the polar regions (Northwinds), he founded an outdoor travel company (Polar Consultants') that he runs with his wife, Kathy McNair. He also presents courses on survival and has a professional team of sled dogs. "I don't have a lot of patience for bureaucracy," he admits when asked to reveal a little about himself. "And I don't like over-populated cities either, or boring films. Nothing gives me more pleasure than taking a group of fit young people out to encounter the dangers of the ice â whether it be on glaciers, icecaps or pack-ice..."
November 2006 âJanuary 2007 : Teamn2i Antarctic Expedition. With a team of four (Rupert Longsdon, Rory Sweetand and Jenry Cookson), Paul Landry has joined the pole of Inacessibility, starting from the Russian scientific base of Novolazarevskaya at the coast. They left the base on December 8th and reached their goal on January 19th, covering a total distance of 1 756 km. March - June 2006 : Top of the World ; together with David de Rothshild, Martin Hartley and Sarah McNair-Landry, he has tried an attempt to cross the entire Arctic Ocean. This project was initiated by David de Rotshild and Adventure Ecology. June 2003 : Greenland Ice Cap Crossing. Crossed the Greenlandice cap with the use of dogs, skis and kites, pushing the standards on expedition updates with daily text, photo and video updates from their tent directly to their web site. November 2002 â January 2003 : South Pole Expedition. Guided an expedition for Adventure Network International (ANI) to the South Pole with three clients: Tom Avery, Patrick Woodhead & Andrew Gerber. Using power kites, they wereable to complete the journey in 48 days. March 2002 â May 2002 : North Pole Expedition. Guided an expedition to the North Pole with one client: Swee Chow. They traveled from Ward Hunt Island to the North Geographic Pole, making the journey in 46 days. November 2001 â January 2002 : South Pole Expedition. Guided an Adventure Network International (ANI) expedition to the South Pole with two clients: Chris Weyers from Australia andTimo Polari from Finland. They started Nov. 29 from Hercules Inlet, traveled south along the 82nd meridian and reached the South Pole in 58 days. March 2001 â May 2001 : North Pole Expedition. 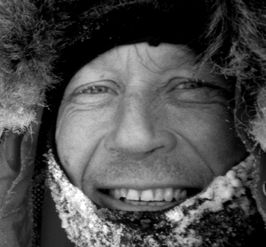 Guided the British Millennium North Pole expedition in 2001 with Mike and Fiona Thornewill and Katharine Hartley. Fiona & Catharine became the first women to reach both North and South Poles. The journey was completed without incident in 56 days. March 2000 â April 2000 : North Pole Expedition. "Huskies to the Pole â In the Footsteps of Peary." They departed from the most northern point of land in Canada, Ward Hunt Island, on March 3rd and arrived at the Geographic North Pole 42 days later, on April 13th, 2000 thus proving that Peary's 1909 claim of reaching the Pole in 38 days is definitely within therealm of possibility. Landry's partner and himself emulated Peary's travel techniques: they departed early in the season and used the same number of dogs pulling sleds weighing approximately the same as Peary's. April 1998 : Magnetic North Pole Expedition. In 1998, Landry completed an unsupported dog sled and ski expedition from Resolute to the Magnetic North Pole, covering a distance of 600 kilometers in 15 days. His British client and himself used the Norwegian "polar travel method" perfected by Sverdrup and later Amundsen during his successful expedition to the South Pole. The Norwegian approach is to combine dog sledding andskiing, with the skiers holding onto the back of the sled whilethey shuffle along on skis reducing the weight on the sled and allowingthe dogs to run at a faster speed. We averaged 45 kilometers per day and arrived at the Magnetic Pole on May 4. February 1990 â June 1990 : Baffin Island Expedition. Member of the Baffin Island Expedition: a 4,000 kilometers, 4-month dog sled journey around Baffin Island. They traveled to eight communities on Baffin Island and had the opportunity to immerse themselves in the Inuit culture.